It's that time of year again! Coaching school is just a few weeks away. This year our coaches head back to San Antonio, and if you are like my family, you're taking advantage of Texas's #1 tourist destination and tagging along for a mini-vacation before football is in full swing. For me, having grown up in this city, it's a trip home. Now, this list isn't just for football coaches and their families. If you feel like making a weekend getaway, this list is great for you, too! I know you know about the Riverwalk, Sea World, and Six Flags Fiesta Texas, but these places can rack up a pretty hefty bill for the average family. So I'm going to share how the locals spend their stay-cations and save their $$ with a few hidden gems in Alamo City, aside from the Missions (which I highly suggest visiting). All of the following places are located just north of downtown, if not in downtown. You don't have to venture far to experience some of the great things San Antonio has to offer. One of the newer additions to San Antonio, this isn't your everyday museum. The DoSeum is a place that allows kids to be kids while exploring hands-on learning activities focused on Science, Technology, Engineering, Arts, and Mathematics (STEAM). Every exhibit is hands-on and encourages kids to actively participate, whether it be the Little Town for the little bitty ones or the Spy Academy & Innovation Station's robotics for the big kids. The Museum features a cafe as well as two outdoor areas for kids to burn that energy while the coaches are in their conference. You must have a kid with you to enter the museum, and memberships to other Museums that are part of the ASTC partnership are accepted. Admission is $14 (kids under 1 years of age are free). Teachers and educators received $1 off admission with valid educator's ID. Originally opened in 1925, Kiddie Park was the place to be when I was a kid. It shut down in the early 90s - a sad day for kids across San Antonio, let me tell you! It sat, left undisturbed for almost two decades until it was threatened to be sold and torn down. This wonderful young family rushed in and bought it, refurbishing everything they could (and re-purposing what they couldn't). They had grown up going to Kiddie Park and they wanted to make sure the next generation could have that magical experience as well. All the rides are vintage and SAFE, including the famous hand-carved Herschell Spillman carousel from the 1920s. They are all kid-sized! No scary big roller coasters. The best part of Kiddie Park is the price! Just $13 gets your kid an unlimited ride wristband. There is no park entry fee, just ride tickets. Adults actually get in free for once. Oh, and parents can even ride the carousel and the flying saucers for free, too! You can save a little extra by bringing your own lunch into the park, but no outside drinks are allowed in order to keep alcohol out. A few blocks down Broadway from Kiddie Park you will find the Witte Museum on the left. If you've passed a dinosaur, you've gone too far. Well known for school field trips for any San Anotnio kid's elementary school years, the Witte underwent a major renovation and improvement project last year. Here's you'll find a lot of Texas history, especially this year's exhibit about San Antonio! We're celebrating it's 300th birthday you know. She looks good for her age, doesn't she? My favorite part is the display of fiesta dresses worn by the fiesta royal court. Years ago, the royal court began to wear comfortable shoes while riding in the Battle of Flowers Parade. Thus began the tradition of "Show me your shoes!" Each year the shoes get more unique and embellished to the point that the shoes are just as loved as the dresses. While the little princesses may love dresses, I realize not all will, so we'll move on to this summer's Texas dinosaur exhibit Predator vs Prey: Dinosaurs on the Land Before Texas. So cool! General Admission is $12 for adults, $9 for kids (3 and under free). Exhibits are extra. Memberships to other museums in Texas will cover General Admission if they are part of the ASTC partnership. The Magik Theater turns your favorite children's literary stories into the best theatrical performances that secretly include education and learning without your child noticing. Their mission is to begin the public's love of theater at an early age with professional plays and experiences. Sometimes the kids in the audience are involved, too! Three great sites in one small area! (FYI, this is right around the corner from Kiddie Park and The DoSeum). The Zoo has undergone some major renovations the last few years. While you can no longer ride the elephants and camels like we did long ago when we were kids, you can feed the giraffes and get an underwater view of Timothy, the baby hippo making waves on social media by courting Fiona, another baby hippo at the Cincinnati Zoo. When you're done being wild with the animals, take a nice relaxing ride on the carousel or the zoo train through Breckenridge Park. The train will even drop you off at the Witte Museum! 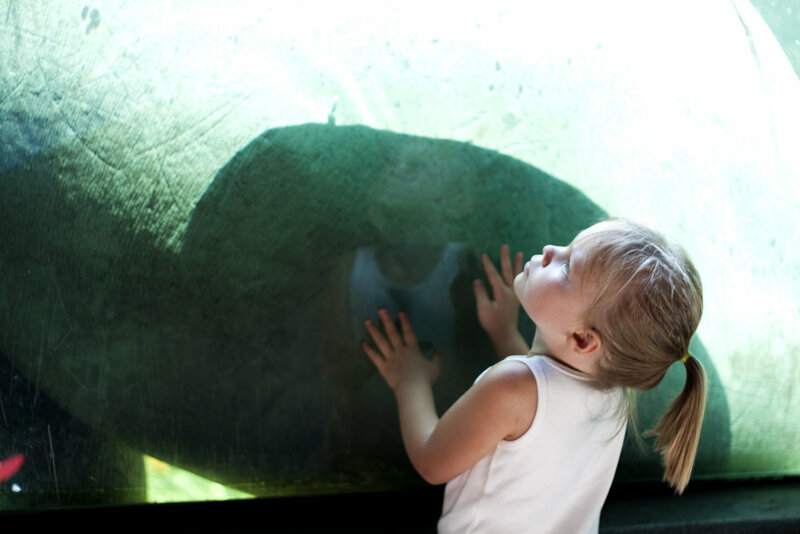 Zoo Tickets: $17.50 for adults, $14.25 for kids three and over. During the month of July, admission is 50% off after 2 pm any weekday. If you're a gardening nut like me or just love pretty flowers this is the place for you. If you're a mom of young kids who are hot, sticky, and bored, this is the place for you, too. The Botanical Gardens just completed a major expansion project, adding on the fabulous Family Adventure Garden. Your kids can roll down Tumble Hill (because we know how much coach kids love turf! ), meander through Muhly Maze (No big walls, so no lost kids), and find your way through Thunder Ridge to find No Name Creek, a shallow splash zone perfect for cooling off during those hot summer days in San Antonio. There's also a secret garden complete with large sandbox and lounge chairs for mom to relax and work on her football tan. You'll find life-sized gnome houses up Huisache Way (pronounced wee-satch) or catch a puppet show at Thistle Theater, and so much more. Oh, and there's the rest of the gardens and conservatory, too. You can also enjoy coffee & cocktails, brunch & lunch in the old carriage house. I have yet to eat there since it's been reopened but I will be this coaching school trip! Admission to the gardens is $12 for adults, $9 for children 3-13. Of course, you can dine at the Carriage House without admission to the garden. A Texas history lesson in an afternoon located right next door to the Convention Center where the coaches will be. The ITC is a lesson in the diversity and history of the various cultures that have made Texas what it is today. This used to be one of my favorite spots, and once upon a time, I could give you the walking tour. Why? Because my dad was the chuck wagon man! Yes! My dad, ever the Texas historian, dressed up like an old cowboy cook and shared stories and info about life on the Texas Trail. Admission for adults is $10, minors age 6-17 is $8, kids 5 & under are free. While you're downtown, spend a few hours in Market Square. There's some great shopping, especially if you love rustic home decor items, traditional blue glass margarita glasses, and the ever so comfortable and now trending puebla dresses. Seriously. They're $100+ in boutique shops in DFW. They're $30 in San Antonio. One thing you MUST buy while you're there: A bottle of Mexican Vanilla. It's huge and will last you two years. And it's under $15. I put that stuff in EVERYTHING. Coffee, all baked goods, pancakes & waffles, oatmeal, and Rice Crispy Treats. (BEST CRISPY TREATS EVER). You can also get a bite to eat! Now, I know Mi Tierra is right there and world-famous; HOWEVER, Don't eat there. The food is ok, but they are way too focused on getting people in and out because there are so many to serve, and the line is horrendous! That being said, stop into the Mi Tierra Bakery. Get a few empanadas and pan dulce for breakfast the next day, and don't even ask about the calories. They are worth it. For a meal, head right down to the next restaurant in Market Square, La Margarita. Why? Because the Cortez family owns both, with nearly the exact same menu. The service and food are better at La Margarita and they don't rush you in and out the door. (I learned this from one of the Cortez grandkids I was friends with in high school). OR, if you're on a budget, go into the market and order from one of the various vendors inside. Their $3 tacos and tortas and pretty dang good, especially with an agua fresca to wash it down. So while we locals love and are quite proud of the Riverwalk, we rarely dine there. Usually only when out-of-town guests come to visit. So I'll let you know where we go both on and off the river. For mexican food, take your pick of Acenar, Las Canarias, La Paloma, or the Original Blanco Cafe. Paesano's is fabulous for Italian. Rio Rio and Casa Rio are the restaurants with the colorful umbrellas that you always see in Riverwalk photos. They are really tourist spots so the food isn't that great. Shortly after my husband and I were married, we had date night on the river thinking it would be fun. I think we ate at Rio Rio. That's when I learned they didn't even make homemade tortillas anymore. I was less than disappointed. That being said, Rio Rio has a walk up & walk off bar. If you head upriver where the Riverwalk ends (or is it begins?) to the Pearl Brewery, I highly recommend the patio and a Molcajete at La Gloria. It's a little more traditional Mexican fare than the rest of the river restaurants, but SO good. The Pearl is a great way to spend some time at while the coaches are busy. Shopping and lots of local fare that's been making world wide food news, like Cured. You can take a tour of the old Brewery and peek into the Hotel Emma (It's GORGEOUS!!). By the way, Hotel Emma is celebrating San Antonio's 300th, too with $300 celebratory rates this summer! The Pearl also features four public spaces for live entertainment of just a little free fun, the Amphitheater, Parkito for kids, Plaza and the Pearl Park with & Gustav’s Geysers splash pad. The spaces are open to the public and are dog friendly. They have free WiFi and allow you to bring in food and non-alcoholic beverages. Ok, now back to food. Try Twin Sisters Bakery & Cafe in Alamo Heights for a healthy yet delicious breakfast. Their homemade breads and sweet potato muffins are so good I always get one to take home. Actually, everything is delicious. Sundays they only serve breakfast all day. Taco Garage is one of the newer spots with pretty dang good food, but their prickly pear margarita is my favorite thing on the menu. YUM!! For a greasy hole in the wall that makes you want to lick your plate, try Los Barrios on Blanco Rd. La Fogata is a local favorite, but quite a ways away from the Riverwalk. For more "refined" Mexican cuisine, try Paloma Blanca on Broadway. And finally, for the kids who won't eat anything buy hot dogs, burgers, and french fries, Cheesy Janes! It's just up Broadway from the Witte Museum and oh so good! The restaurant is kid's happy place with bright colors, a toy train that runs around the ceiling. Their menu features all the yummy not-so-good for you burgers, sandwiches, and every-flavor shakes and malts, but their salads are their best kept secret. Not really anything fancy, just good. It can be a long walk from downtown to the Pearl and back. Everyone loves the river barges, but few know how to ride like the locals do. Whatever you do, do not go down to the main riverboat stand and wait in line for a tour. Instead, find a taxi stop along the river (they look like sidewalks into the river). The Taxi's will have GO RIO Shuttle signs. You just wave a barge down like a New York City taxi. Usually your driver will go ahead and give you a "tour" along the way. That's it! Thanks for reading this rather long guide to San Antonio. If you try any of these places, let me know what you think! Have a great time at coaching school!